Get a light charting control for simple data visualization with ComponentOne Sparkline™ for WinForms. Sparklines are a great way to visualize trends in small spaces like data templates and on dashboard tiles. 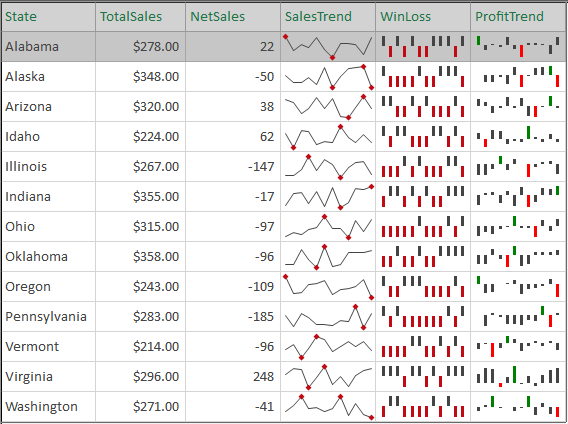 The Sparkline control supports three different chart types: column, line, and win-loss. The column sparkline draws the values as a column chart, while the line sparkline draws the values as a line chart. The win-loss sparkline shows points with the same size. Negative points extend down from the axis, and positive points extend up. The sparklines can display colors for the marker points. You can set colors for the high, low, negative, first, and last points. Not only does the Sparkline control support horizontal and vertical axes, but you can also configure a date axis by supplying a collection of dates that act as X-coordinates.